Please note that we are injecting $log service into the controller function to log the events. In our previous video, we used $$route.originalPath property to get the route that the user is navigating to. 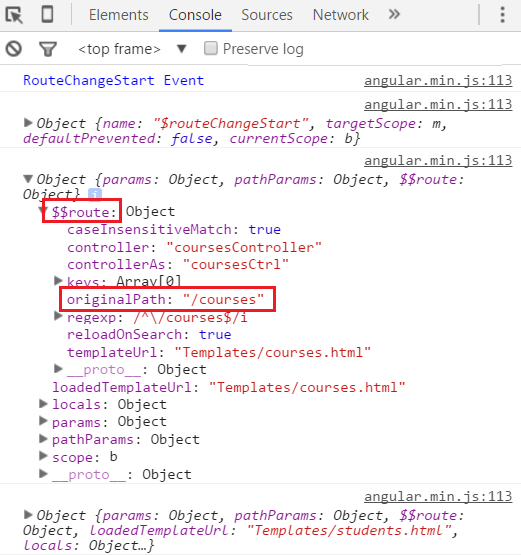 How do we know next parameter has $$route.originalPath property. Well the easiest way is to log and inspect their properties. The following code does exactly the same thing. In this example we have logged just $routeChangeStart & $locationChangeStart events parameters. In a similar way, you can also log $routeChangeSuccess & $locationChangeSuccess events parameters. HTTP could not register URL http://+:8070/. Your process does not have access rights to this namespace (see http://go.microsoft.com/fwlink/?LinkId=70353 for details). Why did we change $rootScope to $scope? Is it like the success events get triggered from different controllers?